A digital communications strategy formalises your communications across all digital platforms. By examining what your goals are with your communications, you can best determine who your audience is, and what the best way of communicating with them is. It documents which channels will be used and who is responsible for maintaining those channels. Clubs and districts generally consider each digital medium, be it email, their website, social media, electronic newsletter and the like, in isolation, with information spread on a variety of these platforms without stepping back and considering what they want to communicate, and more importantly, why they want to communicate with others, and what is the best way to engage others in conversations around their key messages. We only have 1 or 2 people managing our communications. Do we really need a communications strategy? A strategy helps you communicate as effectively as possible. If you haven’t thought about what the purpose of each of your communications is, you won’t be communicating as well as you could be. Many people set up a Facebook page because they’ve been told it’s the right thing to do, but then have no idea what to actually put on it. Active twitter accounts become dormant in the new Rotary year when responsibility for PR is handed over to someone new who doesn’t understand how to use that medium. Others blast out emails that are simply trashed without being read. If you are perceived as spamming your message, on any medium at all, people will screen you out. I’ve also seen several instances, at both club and district level, of there being 2 Facebook pages for the same entity. Which is the “official” one? None of this would happen if an effective communications strategy was in place. Part of having a strategy is having specific people, and ideally, at least 2 people, responsible for any particular medium, so that if one is no longer willing or able to continue maintaining communications there, you don’t end up with an abandoned platform and have to build up your audience again somewhere else. It also avoids 2 people with very different ideas about how it should be done setting up competing channels, and diluting the message or possibly even spreading misinformation. 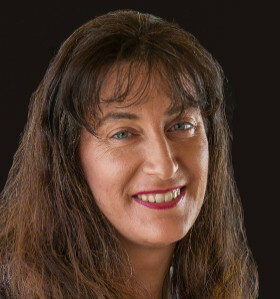 Having a digital communications strategy in place makes sure that your efforts are co-ordinated, that the correct channels are used and that your audience can be assured that they are dealing with an official channel rather than a rogue member who has decided to simply start something up without consulting the board. How do you create a communications strategy? First of all, determine what you hope to achieve through your communications. What is the tangible outcome that you are aiming for? find potential applicants for a program? source more volunteers to help with a local project? find partners for an international project? Be clear about what the specific action is that you ultimately want to happen. “Raising awareness” is not an action to aim for – raising awareness to what end? Raising awareness is part of the strategy, not the end goal. Once you know what your goals are, then you can determine who exactly are the people that you want to reach to achieve them. These days communication is not about blasting your message out, but building relationships and actively engaging in conversations with people. It’s not about you – it is about them. How does your target audience like to communicate? What is the best way of reaching them? When you know who you want to communicate with and where to find them, then you can determine which is the best tool, or set of tools, to use to reach them. It is in this step that you can determine whether your strategy should include a Facebook page, a Facebook group, Facebook ads, a LinkedIn group, Twitter, an e-newsletter (which itself can come in various formats), blog, website, Google+ page, and so on. You may use a combination of these, keeping in mind that different platforms serve different purposes, so it is not simply a matter of cutting and pasting the same thing over and over – your message needs to be tailored appropriately. Don’t waste resources on media that won’t help you achieve your goals. Focus on what will give you the best return for your time, and be careful not to spam! After you have selected the platforms you will use, then you can determine who is responsible for the communications on each of those platforms. Ideally, each platform needs at least 2 admins so that there is always at least one person able to carry out the work if another is no longer willing or able to help. Each admin should understand how to use that particular platform effectively, which may require training. The members responsible for sending out communications and participating in discussions with your audience need to be clear on what is appropriate to post. What voice should they use? Should they be signing their name, or are they acting anonymously on behalf of the club? What accounts are appropriate to “follow” or “like”? How and where should they handle negative posts? It should also be determined how each of these coordinators will communicate with the others involved in maintaining the website, engaging in social media, blogging, and sending emails, and how they will in turn communicate with the rest of the club, district or committee. None of these should be done in isolation; communication needs to happen internally as well as externally. Other useful resources include my guidelines for using social media for Rotary at a personal, club and district level and best practices for developing a social media policy. I originally published this article on rosnf.net on 11 October 2012. In June 2012, the Rotary Club of Willetton, District 9465, Western Australia, finished its first ever Facebook Ad campaign. The aim of the campaign was to gain new members, not simply gain awareness of Rotary. 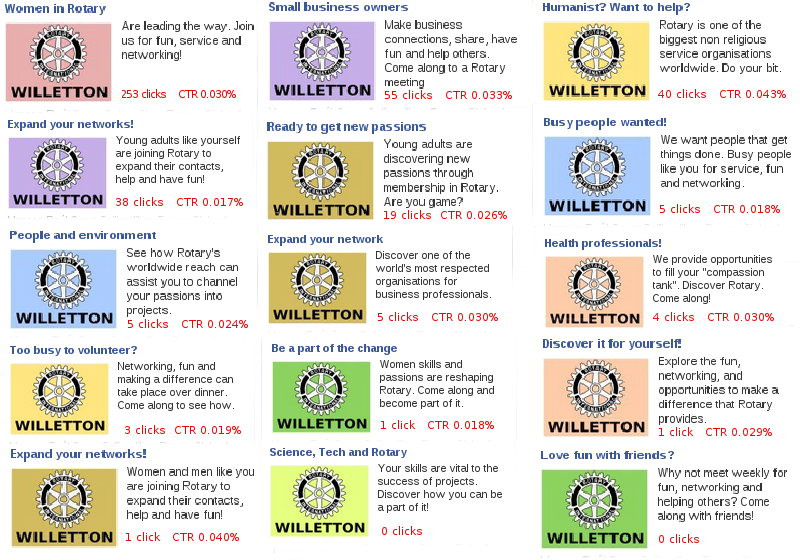 As such the ads took people to a landing page built specifically for that purpose on the club’s website at http://rotarywilletton.org.au/index.php?section=about rather than encouraging people to “Like” the Facebook page. Rather than aiming to maximising the clicks, the ads were worded and audiences carefully targeted by age, profession, location, interests, beliefs etc to limit exposure to people thought to be qualified for membership and more likely to take action to eventually join Rotary. The landing page emphasised that commitment is required, but that in return you have fun and feel good. The club specifically did not want to say things like “attendance is not really that important” or “it really does not take time”, choosing instead to rule out anyone not willing to make an ongoing commitment. 430 clicks that resulted in 5 enquiries, 2 of whom have since joined, 2 more are being followed up and the 5th is looking first for a closer club. 15 different versions of the ad were used, targeted to different audiences. By far the best performing ads were two directed to women 25-55 years old within 15km of the meeting location. All 5 people that contacted the Willetton club were women that clicked the first of those ads. Ads targeting small business owners and young adults aged 27 – 37 years old who have completed university studies were also popular in terms of clicks, but none of them resulted in a visit to the club. Compared with previous attempts with fliers in the local newspaper, at a cost of around AUD $3,000, which reached about 30,000 people and resulted in one new member, this was considered to be a far more successful approach at a fraction the price. I originally published this article on rosnf.net on 2 October 2012.